WINNER OF A GOURMAND WORLD COOKBOOK AWARD 2009! "I really enjoyed this book … A constant feature of this book is how well Keith balances his mastery of the technicalities with a certain 'common touch', the ability to explain sometimes complex issues in easy-to-understand terms." "… an ideal book to accompany a WSET course." Throughout the eight thousand years of vinous history wines have been tasted and their qualities examined in at least a basic way. Today producers can control the growing and winemaking processes, and the consumer may choose from a vast array of wines, both fine and ordinary. Tasting and evaluating these requires knowledge, skill and diligence. Part of the Wiley-Blackwell Food Industry Briefing Series, this book provides a concise, easy to use and clearly presented understanding of the techniques of wine tasting, quality assessment and evaluation. The reader is taken through the various stages of a structured and professional approach to tasting and the book examines the questions as to what constitutes quality in wines, how quality can be recognised and how it is achieved. Also discussed are the faults that can destroy wines at any quality level, and misconceptions as to quality and guarantees. 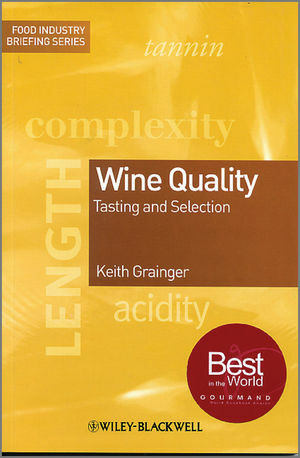 Written by Keith Grainger, highly regarded international wine educator and wine consultant, this book provides a concise, quick reference for busy wine industry professionals, students or others who wish to gain a detailed knowledge of the concepts of wine tasting and quality assessment. Devised to increase the effectiveness and efficiency with which knowledge can be gained of the many subject areas that constitute the food industry, and on which the industry relies for its existence, this important series is intended expressly to benefit executives, managers and supervisors within the industry. Each book distils the subject matter of the topic, providing its essence for easy and speedy assimilation.